Consider expanding upward instead of outward. Make the most of your existing space by growing vertically — saving on new construction. New automated material handling solutions enable safe picking from taller storage, so take advantage of the potential for increased capacity. Explore alternative picking/putaway technologies. Besides automated or robotic material handling, there are other ways to improve productivity and accuracy in picking. Voice-enabled solutions and wearable devices make hands-free operation possible, for increased speed and safety. Pick-to-light systems are another alternative. Utilize automatic identification. Barcode identification labels (or even RFID) on products, cases, and pallets significantly improve warehouse efficiency and productivity. Barcode tracking data in the WMS also greatly increases inventory accuracy — know what you have, in what quantities, and exactly where to find it, even in multiple locations. Costs for the necessary wireless infrastructure, hardware, and software have decreased, making auto ID systems a more worthwhile investment than ever. Improve labeling technology. High-volume activities such as labeling are a good place to look for ways to reduce time and material waste. Microliner, a thinner-caliper backing sheet for labels than traditional liners, allows for more labels on a roll, fewer roll changes (reducing downtime and labor), and less leftover material going into landfills. Plan your warehouse layout for maximum efficiency of movement. 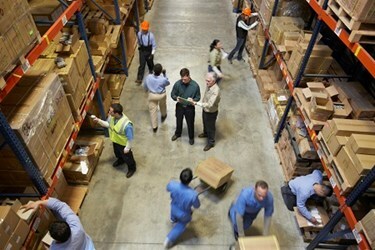 Travel time within the warehouse can eat up a major portion of an employee’s work hours. Arrange your inventory so that “hot picks” are placed closer to the shipping area, while lower-volume items can be shelved farther away. If items are frequently shipped together, make sure they are located near each other to reduce pick times. Monitor your performance. Establish warehouse efficiency metrics so that you can measure the success of your improvement initiatives. Managers and employees alike should have access to this information, as positive feedback on performance will continue to feed productivity. Following these strategies can help you reduce costs and increase fulfillment speed, volume, and accuracy. A focus on warehouse efficiency will benefit your staff, customers, and bottom line.